Water transport is the main mode of transportation in Brazil. In 2017, the Brazilian ports handled over a billion tons of cargo, an increase of 8.3 per cent in comparison to 2016.2 This strong increase indicates a faster recovery from the transport sector in comparison to the overall recovery of the Brazilian economy from the economic crisis faced by the country since 2014. Preliminary data released by the Brazilian Central Bank on 19 February 2018 indicates a growth in 2017 of 1.04 per cent in the GDP.3 The water transport sector represented 3.49 per cent of Brazil's GPD in 2016 and, while updated data for 2017 is not yet available, the increase in the transported cargo and in the number of vessels suggest that such proportion is likely to increase. By the end of 2017, the Brazilian merchant fleet had 5,489 ships: 2,516 seagoing ships and 2,973 used for domestic navigation, figures that represent increases of 3.1 per cent and 6.1 per cent over 2016, respectively.4 Apart from Brazilian vessels, in February 2018 there were 371 foreign-flagged ships operating in Brazil,5 most of them in offshore oil and gas projects. Particularly in the oil and gas industry, the economic and institutional crises faced by the country and Petrobras severely reduced investments. The number of drilling rigs operating in Brazil fell from 80 to 30 between 2013 and 2016. The expectation is that the decrease in the number of offshore drilling rigs will continue in 2018 before the sector recovers. However, the successful bidding rounds carried out in 2017 and the improvement in Petrobras' financial condition indicate that investments in the area are likely to increase in the coming years. In 2018, Petrobras is expected to start operations of eight new production platforms (FPSOs),6 which should also increase demand for support vessels. With respect to the air transportation sector, on 1 February 2018, the Brazilian Association of Airline Companies published research showing the impact of commercial aviation on the Brazilian economy.7 Research shows that the Brazilian domestic air transport market sector grew 3.5 per cent compared with 2016. Just in December, domestic flights increased by 5.4 per cent compared with the same period in 2016. Domestic finance schemes in Brazil for the shipping industry are mainly sourced by the Maritime Merchant Fund, which is a fund that finances the construction and acquisition of ships in Brazil. The purpose of the fund is to develop the Brazilian merchant marine fleet and promote construction in Brazilian shipyards. The fund is formed by tax on freight payable by shippers. It is managed by the Ministry of Transport and Brazilian public banks – such as the national development bank, BNDES – act as financial agents. International finance schemes for ships and aircraft that operate in Brazil, on the other hand, will typically be sourced by the US, European and Asian (specifically, Japanese and Chinese) banking markets. In the offshore shipping sector, high-value assets are normally financed thorough syndicated loan structures and in some of them export credit agencies join the pool of lenders. Bonds and private placements involving foreign investors are also used by Brazilian large-vessel owners. There is no specific legislation governing the finance of ships operating in Brazil. Projects financed with funds from the Maritime Merchant Fund are generally governed by Brazilian law, while parties to international finance structures normally agree to subject the finance documentation to English or New York law. On the aviation finance side, aircraft leases in particular are specifically covered in the Brazilian Aeronautical Code (the Aeronautical Code).8 Operating and finance leases are the main type of contracts supporting importation of commercial aircraft into Brazil. Choice-of-law clauses are generally upheld in courts, provided, among other things, that the terms of the chosen law do not violate Brazilian sovereignty, good practice or public morality. Domestic legislation affecting international finance will typically be limited to capital control regulations and tax matters. There are no capital conversion restrictions in Brazil; however, there are regulations that require certain registrations. Brazilian law has, however, a more prominent role in default or insolvency scenarios, generally by imposing restrictions on enforcements and setting priorities among competing creditors. To record legal ownership over Brazilian ships, Brazil maintains a vessel registry system, which is maintained by the Brazilian Maritime Tribunal. Registration is mandatory for any Brazilian ships with gross tonnage over 100 tonnes. Proprietary security rights over Brazilian ships are perfected and achieve third-party effectiveness upon registration with the ship registry, which also sets priority rules between secured creditors based on the date of registration (i.e., the first to register prevails over others). Brazil has ratified several international conventions related to the Maritime Law, including the 1926 Maritime Liens and Mortgages Convention, incorporated by Decree 351/1935 (the 1926 Brussels Convention); the 1928 Private International Law Convention, incorporated by Decree 18.871/1929 (the Bustamante Code); and the 1982 United Nations Convention on the Law of the Sea, incorporated by Decree 1530/1995. The Brazilian Aeronautical Registry (RAB) is the exclusive registry for aircraft and also registers contracts relating to the registered aircraft therein, such as leases and mortgages. The RAB is an owner register in the sense that ownership is obtained through registration with the RAB. Rights in rem over aircraft such as ownership and security interests have priority over contractual obligations. For conventions related to aviation, Brazil has ratified the Convention on International Interests in Mobile Equipment and the Protocol to the Convention on International Interests in Mobile Equipment on Matters specific to Aircraft Equipment – the Cape Town Convention (CTC). Its implementation decree was published on 16 May 2013. According to the Declarations Brazil approved with the CTC, there is a need to obtain authorising entry points (AEP Codes) from the RAB to effect valid registration on the international interests with the International Registry. Although Brazil is not signatory of the 1986 Hague Convention on Trusts, the RAB recognises the role of a security trustee or of owner trustees. In Brazil, the concept of a trust raises several issues with courts and its full recognition in some instances may be questioned. A trustee would probably be treated as an agent holding interests for third parties. This issue, however, is not entirely clear. Both owner trustees and security trustees are common in Brazil. Brazil is also a signatory of the Geneva Convention, the Warsaw Convention and the Chicago Convention. Mandatory domestic law and regulation will apply to any transaction, party or asset subject to the Brazilian jurisdiction. International laws and regulations arising from treaties ratified by Brazil have to be incorporated before having legal effects domestically. International treaties incorporated in Brazil are understood as being ranked at the same level as domestic ordinary federal law. Rights and obligations created and subject to foreign laws are generally regarded as valid in Brazil to the extent they do not offend public policy, sovereignty and good morals. As a general rule of law, contractual provisions are overridden by legislation considered to be of mandatory application in the event of conflict. This rule will apply to both domestic and international finances when the transaction, parties or assets are subject to the Brazilian jurisdiction. In practice, however, experience shows that mandatory Brazilian laws only affect international finances more substantially in default or insolvency scenarios. The Brazilian Banking Law (Law 4,595/64) created the National Financial System, which is formed by the National Monetary Council (NMC), National Council for Private Insurance and National Council for Complementary Pensions. 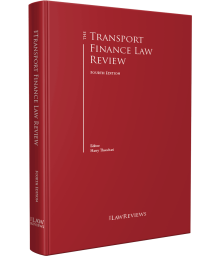 Banks funding the transport sector in Brazil are affected by regulations of the NMC and Brazilian Central Bank (BCB). The NMC is the main regulatory authority for the financial market, while the BCB is the supervisory authority for financial institutions. 'Resolutions' issued by the NMC represent the highest level of regulation within the Brazilian Financial Market. 'Resolutions', 'circulars' and 'circular letters' issued by the BCB are mandatory regulations addressing subject matters to which the law has attributed authority to the BCB. Basel implementation in Brazil has primarily focused on standardised approaches to credit, market and operational risks. The BCB implemented Basel II regulations in 2007 and Basel III regulations in March 2013. The Basel III regulations were introduced through a combination of BCB resolutions and circulars that became effective in October 2013. These regulations include definitions of regulatory capital, capital requirements and capital buffers; components of risk-weighted assets; risk management, liquidity management, capital management and senior management compensation; disclosure of information; and preventive prudential measures. The BIS Committee, however, also pointed out that minimum capital requirement regulations (Pillar 1) on credit risk and capital buffers were found to be only largely compliant and, although this had a limited impact on the overall assessment, indicated the need for future assessments. In relation to capital buffers, deviations were generally found to be immaterial and the Brazilian regulations to assess market risk were considered more restrictive than the Basel III standards. Regulations on legal and regulatory framework and supervisory actions regarding the supervisory review process (Pillar 2) were the other components found to be only largely compliant by the BIS Committee, and would be kept under review. In summary, Brazil's implementation of the Basel risk-based capital regulations has been closely aligned to international standards, where 11 out of 14 assessed components were found by the BIS Committee to be 'compliant'.10 The components that were deemed as only largely compliant had been considered immaterial when assessing the overall compliance status. According to the BCB, the following issues are expected to be reviewed by the BCB between 2017 and 2018: (1) treatment of banks' investments in commercial entities along with a revision of the limits on fixed assets, (2) revision of current capital requirements for bank exposures to relevant counterparties, (3) implementation of the standardised approach for counterparty credit risk framework, (4) full revision of the securitisation framework and Pillar 3 regulation. The BCB is the financial institution supervisory authority in Brazil. Failure to comply with the BCB regulatory framework, and with regulations cascaded from the NMC, may result in sanctions ranging from fines to licence cancellation. Finance providers in domestic financings may require a security package including mortgage, fiduciary assignment (title-retention instrument), assignment of earnings and insurances, assignment of receivables, step-in rights under existing long-term charter contracts (typical for high-value offshore units), pledge over bank accounts, pledge over shares of single-ship-owning companies and bank guarantees. For ships under construction in Brazil, finance providers may require a mortgage apart from other collateral typically required in ship finances. This type of mortgage is possible in Brazil only when the construction has started, and will affect the parts of the ship as they are built. It is not possible under Brazilian law to create the mortgage over the entire ship prior to or during its construction. Brazilian mortgages cannot be created over future assets. It is, however, much more likely for ships under construction in Brazil that financiers require a fiduciary assignment over the ship instead of a ship mortgage. The fiduciary assignment has a number of benefits in Brazil compared to a ship mortgage. This includes better protection for the security holder in the event of insolvency of the borrower, given that the ship's title is held by the security holder until the discharge of the secured obligations. In an insolvency of the borrower, the ship is not subject to priority rules among the creditors of the borrower. Another benefit of the fiduciary assignment is that the borrower, for not having ownership but only possession of the ship, has no right to dispose of or place an encumbrance on the ship in any form except for maritime liens arising from regular trade. Finance providers may also require the assignment of the buyer's right under the shipbuilding contract and any associated guarantee or security provided to the buyer for the obligations of the shipbuilder. As to aircraft financing, only registered aircraft in Brazil are subject to Brazilian mortgages. An aircraft that has never been registered in Brazil may not be subject to a Brazilian mortgage. Brazilian mortgages, after being fully perfected by registration with the RAB, will afford a first priority security interest in rem over an aircraft in favour of a mortgagee. Considering the recent accession and ratification of the CTC, there is a lack of precedent at the judicial and administrative levels to ensure the immediate and literal application of all terms and conditions thereof. However, we are of the view that there are legal grounds to argue that such treaty should prevail, in accordance with its terms and the declarations deposited by Brazil, in respect thereof. After registration with the International Registry, Brazilian mortgages and leases in relation to registered aircraft in Brazil should create security interests valid internationally. Generally, Brazilian courts are expected to enforce consensual security interests perfected in accordance with the applicable law. State courts have jurisdiction over foreclosure actions based on valid security interests. The usual procedure includes seizure of the asset given as security, official appraisal, and judicial sale of the assets. On 18 March 2016, a new Code of Civil Procedure (CCP) became effective. The statutory changes made through the CCP are intended, essentially, to improve the speed and the effectiveness of civil court proceedings. One provision of the CCP that could be particularly relevant refers to foreclosure actions, which can now be proposed directly against the owner of the collateralised asset, and not only against the principal debtor, its assignors or successors, which was required under the revoked CCP. The change consolidates an understanding that was already largely accepted by Brazilian scholars and courts. According to such understanding, a beneficiary of a security interest may take action directly against the owner of the property in cases where the principal debtor and the owner are different individuals or entities. This provision may also be relevant if a secured property is transferred and the relevant beneficiary of the security needs to enforce its in rem rights against the new owner. This is particularly important in relation to Brazilian mortgages, since the principal debtor is not required by law to obtain consent from the beneficiary of the security before transferring title to the property. A contractual provision demanding such consent may be held invalid. However, Brazilian law would allow for a provision under the financing documents to establish that a transfer of title without the consent of the security holder represents an event of default. Ship finance providers in a default or insolvency context will typically consider enforcing mortgagee's rights to secure the payment of the debt. Because self-help remedies are not recognised under Brazilian law, a mortgagee in such a case has to seek court intervention to enforce its rights. A mortgagee cannot request in court to take possession of a mortgaged ship. Under Brazilian law, the mortgagee's main right is to request the court to seize and auction the mortgaged asset. The security holder of a fiduciary assignment is, however, the legal owner of the collaterised asset and can thus repossess it from a defaulting borrower. Recent practice in insolvency cases has proven that controlling the movement or effectively taking possession of a collateralised ship in Brazil is often achieved more efficiently by a combination of out-of-court negotiations and other alternatives, such as taking control of the borrower through an existing share pledge. In a default context involving securities over vessels, maritime liens created by operation of law also have to be considered when assessing the rank of priority of security interests deriving from the finance documentation. In relation to mortgages over aircraft, in case of an event of default under a Brazilian mortgage, the mortgagee may pursue foreclose proceeding pursuant to such Brazilian mortgage; however, the mortgagee would not be automatically entitled to seek repossession of an aircraft from a lessee. In an insolvency context, enforcements depend on the nature of the security interest. Credits secured by fiduciary assignments are generally not subject to effects of judicial recuperation or bankruptcy proceedings. Other securities will be subject to such proceedings and payment of the debts will occur insofar as higher-ranked competing creditors under the Brazilian Insolvency Law are paid first in a liquidation proceeding or subject to the judicial recuperation plan. Insolvency contexts also trigger stay periods, in which no legal action can be taken against the debtor to secure payment and hardening periods, which may lead to the invalidation of securities created over debtor's properties prior to bankruptcy. The Bankruptcy and Restructuring Law (NBRL) allows airlines to avail themselves of insolvency protections roughly similar to the US Chapter 11. There is no stay in the NBRL for aircraft leases, but the CTC has adopted a stay period of 30 days. This has not yet been tested, but in principle a lessor should be able to repossess an aircraft from an airline that is restructuring within 30 days, unless the airline is complying with its lease obligations. Brazil has not ratified the Conventions on the Arrest of Ships of 1952 and 1999. Ships can generally be arrested on the basis of the Brazilian Commercial Code and the Brazilian Civil Procedure Code. Arrest can also occur on the basis of the 1926 Brussels Convention, the Bustamante Code, the International Convention on Civil Liability for Oil Pollution Damage and the Assistance and Salvage Law (Law 7,203/84). Under Brazilian law, there is one category of maritime claim that can be brought by way of arrest of a ship. This category is described in the Brazilian Commercial Code and provides that as long as maritime privileged credits existing against the ship continue to exist (the law actually speaks of 'privileged' claims), the arrest may be granted. Privileged obligations have in rem effects, and constitute a maritime lien over the ship. The list of maritime privileged credits that gives rise to a maritime lien on the vessel includes mortgagee's rights. The entire list is found in the Brazilian Commercial Code and is amended and complemented by the 1926 Brussels Convention. In addition to maritime liens, which is the main category that can give rise to the arrest of a vessel, there is a second type of claim that might cause the start of a judicial arrest of the vessel not as consequence of an in rem obligation but as a consequence of an in personam obligation. By way of a right of attachment, the CCP allows a party to seek conservatory detention of the vessel through an ex parte order seizing a vessel based on elements capable of proving the probability of the alleged claim (fumus boni iuris) and the risk of loss or damages to the useful outcome of the lawsuit (periculum in mora). The arrest, or embargo, of a ship is a provisional remedy in Brazil, adopted to secure an underlying claim that is subject to the Brazilian jurisdiction. Generally, a claim is subject to the Brazilian jurisdiction if the defendant is domiciled in Brazil; if the obligation is performed in Brazil; or if the event giving rise to the claim has taken place in Brazil. The arrest of a ship based on a foreign decision or arbitral award is also permitted. If the arrest order is granted as an urgent interlocutory decision, according to the CCP, the arrest order would be recognised and accepted by Brazilian courts without examination of the merits upon ratification by the Superior Court of Justice. it must not be a decision on any matter over which the Brazilian judiciary has exclusive jurisdiction. If it becomes necessary to enforce a foreign decision or arbitral award in Brazil that is final and on the merits of the dispute, the party seeking the enforcement must first ratify the decision with the Superior Court of Justice to confirm that the requirements (a) to (e) above have been met, in addition to demonstrating that the decision may not be subject to appeal. Again, no examination of the merits is made. Brazil has ratified the 1958 New York Convention. Ships can be arrested in Brazil under in rem or in personam claims. Claims in rem are possible when the creditor has a proprietary security interest over the ship. Claims in personam, on the other hand, refer to credits that the arrestor has against the shipowner and not the ship. Under in personam claims, the arrestor is required to prove with a certain degree of certainty not only its credit in respect of the vessel owner, but also the risk of the frustration of its claim if the arrest is not granted. Typically, the risk of frustration is demonstrated when the vessel that is subject to the arrest proceeding is the only asset of the shipowner and no court bond is provided by the shipowner to secure the claim. In the case of an in rem claim, on the other hand, it is not required that the arrestor demonstrates the risk of frustration. It should suffice in such a claim to prove the mere existence of a maritime lien. Maritime liens include a consensus property security interest, originating, for instance, from a mortgage instrument, and a non-consensus property security interest, secured to its holder through an ex lege security right such as seamen's wages, bunker or port duties. A foreign-domiciled arrestor with no assets in Brazil is further required to secure the payment of judicial costs and attorneys' fees corresponding to 10–20 per cent of the claim value, except if there is an applicable international treaty where such requirement is waived. Additionally, a counter-guarantee may be requested in very exceptional cases, at the judge's discretion, to grant the arrest order. The amount of the counter-guarantee is generally set at 20 per cent or a major percentage over the amount assigned to the debt in dispute. Any guarantee must be posted either in cash, bank guarantee, insurance bond or other collateral acceptable to the court. Generally when dealing with foreign plaintiffs, courts are likely to require cash and bank guarantees. While Brazil does not have specific legislation on wrongful arrests, a separate civil claim can be brought in tort by an arrested party against a wrongful arrestor. In such cases, the arrested party has to prove not only the damage and causation but that the wrongful arrestor acted with negligence in arresting the vessel. The arrested party must also demonstrate that the wrongful arrestor acted in bad faith (e.g., by using false pretences or unsupported facts) when bringing the arrest proceeding. The arrested party in such a claim may seek compensation for actual damages and payment of a penalty for bad litigation ranging from 1–10 per cent of the updated claim value. As for the arrest of a sister ship or associated arrests, Brazil does not have legislation allowing these on the basis of a maritime lien. The alternative in such cases is to enforce a right of attachment, which is an action in personam against the shipowner, and seize the sister ship to secure the main claim. Adjudication (award) – the creditor (including secured creditors) is authorised to request the award of the asset, which transfers the title to the creditor, provided that the creditor offers an amount not lower than the value indicated in the official appraisal of the vessel. Court-regulated private sale – the creditor can procure the sale of the asset by him or herself or through a broker registered with the court upon the judge's authorisation. The judge shall have determined all the minimum requirements (i.e., minimum price, payment method, guarantees, publicity method, etc. ), following a very similar procedure to that of the public auction but by private initiative. Public auction – this is the most common method used for an asset sale. The proceeding requires the publication of an advisory notice at least five days before the auction date to inform possible interested purchasers. In view of the CCP provisions, it is preferred that the auction be made online, although the court may decide in a particular case that the physical auction is more adequate. The valuation of the asset is made through an official appraisal and the court has discretionary powers to set the minimum sale price. The amount of the valuation and the minimum sale price must be included in the advisory notice of the auction. If the court does not set the minimum sale price, the minimum sale price will be no less than 50 per cent of the amount of the valuation. In cases contemplated by law and when the assets deposited in court are subject to quick deterioration or require high custody costs, the judge can order an anticipated sale of the asset by auction. Additionally, the judicial costs involved in the legal proceeding aiming to foreclose on the vessel take preference over all privileged credits. If the sale is completed through the adjudication method, the procedure may be concluded in a relatively short period (around one to three months). The other two methods rarely take less than six months to a year to complete. Brazilian law governs arrests and judicial sales procedures of assets carried out in Brazil. A recent case concerns the recognition and enforceability in Brazil of a Liberian mortgage over a Liberian-flagged floating production, storage and offloading unit (FPSO). The first-instance decision in São Paulo did not recognise a Liberian law mortgage and denied the mortgagee's right of priority against a creditor arresting the FPSO on the basis of an in personam obligation (a defaulted letter of credit). The mortgagee in this particular case is a bond trustee. The trial court judge held that the mortgage should be registered with the Brazilian Maritime Tribunal to be recognised in Brazil. In February 2016, the São Paulo Court of Appeals upheld the decision to not recognise the mortgage based, among other matters, on the fact that Liberia is not a party to the 1926 Brussels Convention or to the Bustamante Code, which, according to the decision, are the only pieces of legislation allowing for the recognition of a foreign mortgage in Brazil. In our view, the decision was incorrect and failed to apply principles of international law (e.g., comity, reciprocity and cooperation between nations) to endorse the law of the flag principle and recognise the Liberian mortgage in Brazil. Moreover, the São Paulo Court of Appeals failed to consider the practical and economic consequences of the decision. In 2016, there were 391 ships in Brazil with flags from countries other than those that have ratified the 1926 Convention or the Bustamante Code,12 and the decision of the São Paulo courts could significantly affect secured creditors of those ships and all future transactions. On 16 November 2017, the Superior Court of Justice granted the Special Appeal filed by the mortgagee and recognised the effectiveness of foreign law mortgages. The Court held that (1) the 1926 Brussels Convention and the Bustamante Code are valid and effective in Brazil with the same hierarchy of ordinary federal laws, (2) such international conventions provide for the general recognition of maritime mortgages governed by foreign laws, (3) the United Nations Convention on the Law of the Sea allows flag states to exercise their sovereign powers to set forth administrative and technical rules applicable to vessels flying their flags, and (4) the registration of the mortgage with the proper registry at the flag state is sufficient to give public notice of the lien over the vessel. Additionally, the Court acknowledged the economic convenience for jurisdictions to recognise foreign mortgages, on the basis that shipbuilders, shipowners and financiers need a safe and predictable economic environment to invest and carry on their business. Although this precedent is not automatically binding to future disputes, it is extremely persuasive. As well as the above case involving the recognition of a foreign mortgage, there has been a recent case concerning a mortgagee's request to arrest a ship simultaneously with the arrest of the same ship by another creditor. In the case, both the trial court and appeals court denied the pleadings of certain creditors to join an arrest proceeding under which the arrest order had already been granted to another creditor. The case illustrates that an arrest order granted in favour of a determined creditor does not benefit a mortgagee nor any other party with interests over a certain asset. In terms of aviation regulation, in June 2015, the Brazilian Senate formed a commission to draft a bill to replace the Brazilian Aeronautical Code (the Code). The intention is to enact a more modern Code, as the existing Code dates back to 1986. Although the draft bill is still being debated and its approval is subject to further discussions and possible changes in the Brazilian House of Representatives and the Brazilian Senate, there are some relevant proposals that we believe are important to consider. The draft bill, in its current state, will include an express reference to aircraft engines in the section that deals with mortgages. At present the current Code has only a broad reference to aircraft mortgages without any express reference to engines. Additionally, engines do not have separate registration in Brazil. The change to expressly include engines will essentially reaffirm existing practice in Brazil, as the Brazilian civil aviation authority, the National Civil Aviation Agency (ANAC) does accept mortgages and other agreements (e.g., leases) in relation to engines, regardless of the lack of any express reference in the Code. In 2017 Brazilian federal government collected 3.72 billion reais through the privatisation of four airports (Porto Alegre, Fortaleza, Salvador and Florianópolis. The federal government left Infraero (the existing administrator controlled by the government) out of the consortiums formed in such privatisations to administrate airports. Finally, in December 2016 ANAC issued Resolution No. 400 establishing new rules for air transport contracts between airline operators and consumers that became effective on 14 March 2017. This regulation mainly changes the rules related to the possibility of charging for luggage, ticket refunds and information to be listed in airline tickets. 1Carlos Rameh, Renata Iezzi, Nicole Cunha and Paulo Mattar Filho are partners, and Victor Fernandes is a senior associate at Basch & Rameh Advogados Associados. 21.086.082.992 tons, according to the Brazilian National Waterway Transportation Agency (ANTAQ). See: http://web.antaq.gov.br/Anuario/. 8Brazilian Federal Law 7,565/1986 (Articles 127–132 and 137).